Yesterday we welcomed 43 new Peace Corps Trainees to Belize. We met the Trainees at the Belize City Airport and welcomed them as they stepped off of the plane. We enjoyed spending the afternoon getting to know many of them and sharing about our lives here in Belize. We are so excited to finally have the new group here, and we look forward to the next year serving together. Check out this article about Eric, a fellow PCT. the street, in front yards, in the parks, and ditches. These guys are everywhere. As Community Based Training comes to an end, it is time to leave Belize City. Yesterday we had our final Kriol Language Class, celebrated with our host families, and said our goodbyes. 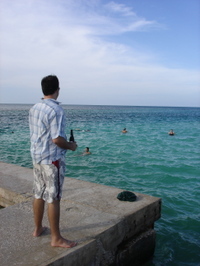 We really enjoyed living in Belize City. Our host family was great, and we met lots of really neat people. I know we will back to visit and enjoy the many great things this unique city has to offer. This morning we woke up bright and early and Mister Dave was up to see us off. We toted all of our stuff which somehow has seemed to grow, and we caught the 5:30 bus to Punta Gorda. The drive wasn't too bad. The bus driver made several stops along the way. The highway was too bumpy except a 10 mile stretch on the Southern Highway that isn't paved due to dispute. After over 5 hours of travel, we finally made it. Over the next few days we hope to explore Punta Gorda a bit more and get to know more about our assignments. Our Kriol Class on our last day. After a busy week, we had a fun and relaxing night out on the town. We enjoyed dinner at the Riverside Tavern along the banks of the Haulover Creek. After dinner we traveled to the Bliss Center for the Performing Arts to see the play Breadfruit Kingdom. The play was presented by Rotary Club Belize. and the proceeds benefited the Gift of Life Program and the Southside Literacy Program. Breadfruit Kingdom was written by Jamacian playwright Patrick Brown. It is a fairytale about the Royal Street Family, the obstacles they face, mostly trying to get someone to marry Princess Street, who has a flatulant problem, and the oppressed people of Breadfruit Kingdom who seek to confront overthrow the king. We really enjoyed the play. It was a great performance with a fun Belize Kriol flare. Last Thursday we loaded up in a van and headed south for Punta Gorda for our Counterpart Conference. After hours of travel, we finally made it. Punta Gorda is a quiet little beach side town. We stayed at a local hotel, ate dinner at Emery's, and explored a little. We even enjoyed some homemade vanilla ice cream from a roadside shop. The next morning we were up early. We enjoyed breakfast at El Cafe, and then we headed to the University of Belize for the conference. A bus was hired to transport several of the counterparts as they traveled from Maya K'ekchi villages all over the Toledo District. For many of the communities, this will be their first time to host a Peace Corps Volunteer. Some communities not only sent counterparts, but also Village Councilmen, Village Alcaldes, and District Education Officers. We discussed expectations, goals, as well as Peace Corps policies and procedures. John and I each had some time to visit with our future counterparts. We even set some preliminary goals for the first couple of months. The Counterpart Conference was a success. There was lots of positive feedback, and everyone seemed to enjoy themselves. The day was finished off with dinner at Gome's. 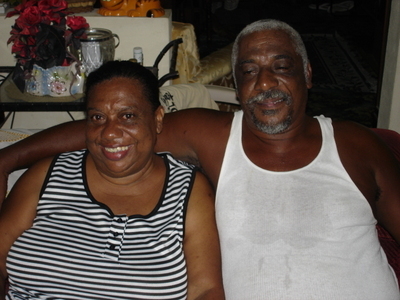 Gome, a local from Punta Gorda, is known throughout Belize for his homemade soy products. On the menu were vegetarian lasagna and tofu curry, both delicious. The next morning we loaded up and headed back to Belize City for a relaxing weekend. Our time in Belize City is almost up. Later this week we will return to PG to get to know our future site a little better. After that, it is back to Belmopan where we will be sworn in as Official Peace Corps Volunteers. We woke up early Saturday morning and caught a bus from Belize City to Belmopan for the day we had all been waiting for. Site Assignments! We walked into the Meeting Room, and on the floor was huge map of Belize outlined with tape. Folders lay face down across the map marking our placements. We were all so excited! One by one folders were picked up and turned over announcing the Peace Corps Trainee's name and the town or village that he or she would be living in for the next two years. Finally, our names were called, and we couldn't be happier with our placement. We are happy to announce that we will be living in the town of Punta Gorda for our two years of Peace Corps service. Punta Gorda, or PG, is a fishing village on the west coast of the Caribbean Sea, and geographically part of Gulf of Honduras. 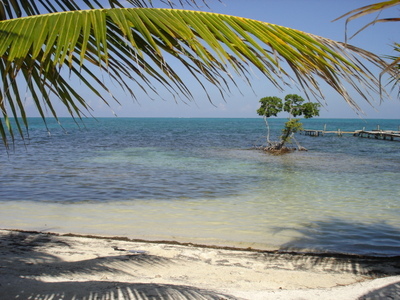 It is the southernmost town in Belize, and is about 210 miles by road from Belize City. It is the capital of the Toledo District, and the population is close to 6,000 people. 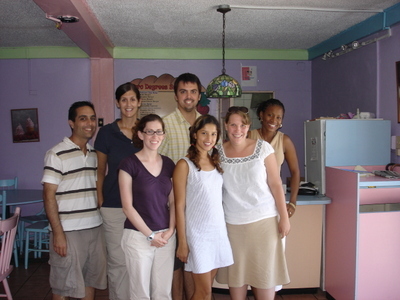 PG has a mix of cultures that consist of Maya Mopan, Maya Kekchi, Garifuna, Creole, Lebanese, Eat Indian, and Chinese. We will both be working as Teacher Trainers in local schools. I will be working with teachers on literacy development at a lower division school, and John will be working at two schools in a nearby village focusing on a computer literacy program and a gardening program. Punta Gorda will also be home to 4 other Peace Corps Volunteers, so there will be six of us living and working in and around PG. Several other PCT's have been assigned to smaller villages around the Toledo District. Fifteen of the total BZ 45 Group will be living and working in Toledo. This week we will travel south for a Counterpart Conference where we will meet our counterparts and discuss our projects. Next week we will travel to PG for a Future Site Visit, and then it is back to Belmopan for our official Swearing In as Peace Corps Volunteers. This week we have been working with the YWCA at their Summer Reading Camp. It has been good practice working with students at varying reading levels. Many teachers struggle with this, and as Teacher Trainers we will be working with Belizean teachers on the meeting the needs of all of their students. In Kriol Class we have been discussing transportation, health, food, and safety, and clothing. We traveled around Belize City and checked out the city buses, local clothing shops, and grocery stores. It has been great to get out into the community. This weekend we will find our permanent site placements. So stay tuned for more info about where we will be living for the next two years. 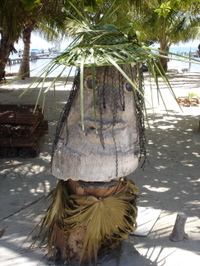 This week we traveled to the Kriol fishing village, Gales Point, about 25 miles down the coast south of Belize City. Often called Manatee, Gales Point is believed to have been settled over 200 years ago by runaway slaves of Nigerian Ibo, and it has strong African Roots. Gales Point is located on a 2-mile long peninsula that stretches northward into the Southern Lagoon. 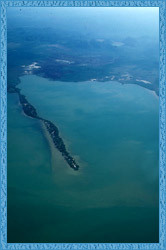 The Southern Lagoon, along with the Northern Lagoon, is part of a huge estuary system of rivers, streams, waterways, and channels between Belize City and Dangriga. The brackish water of the Southern Lagoon is one of the ideal habitats for the West Indian Manatee. As a part of Education Tech Training, we conducted a workshop for the Wildlife Trust. There are several protected areas for Manatees in Belize, and the Wildlife Trust has helped fund and create a Manatee Education Program for the country. We helped train individuals from two Community Based Organizations who will be using the program to help educate Belizean Students about manatees, their habitats, threats, and how they can help. 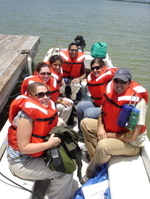 The two-day workshop was held at Tiger Point, across the lagoon, 10 minutes by boat. This mostly uninhabited stretch of beach is the main nesting spot in Belize for the endangered Hawksbill Sea Turtle. 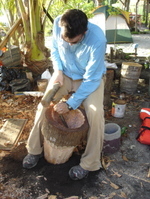 We stayed at Gentle’s Cool Spot, and we made a stop at the Maroon Creole Drum School, where John helped in the carving of a drum that was being made. We even participated in a local Sambai drumming and dancing circle led by Emmett Young, local drum maker and owner of the drum school. 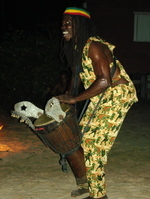 We spent the evening on the beach and enjoyed the drumming, singing, and dancing by firelight. The workshop was a success, and we enjoyed getting to know a little more about what makes Belize so special. After Kriol Class on Saturday morning, we caught the water taxi and headed to Caye Caulker for the night. 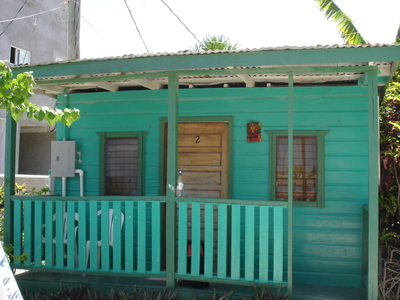 Caye Caulker is an island about 20 miles north of Belize City. It is about 4 miles long and less than a mile wide. 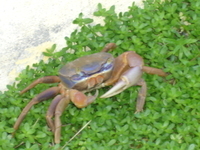 It is a laid back fishing village that accommodates travelers of all sorts. We stayed in quaint little bungalow at Popeye’s and enjoyed a rather relaxing weekend. We hung out at the northern end of the island at the Lazy Iguana and at the local beach, where in 1961 Hurricane Hattie carved a split right through the island. There are now bits and pieces of a causeway, and it is a great swimming spot. We ate lunch at the Rasta Pasta Rainforest Café, dinner at the new hot spot Agave, and then it was back to the Rasta Pasta for dancing and Karaoke. For breakfast we enjoyed grilled cheese sandwiches and fresh fruit, and then we headed back to the beach. We caught the 1:30 Water Taxi back to Belize City and spent the rest of the evening hanging out with out Host Family. It was a great weekend, and we enjoyed the break, but it is back to work today, as we continue Education Technical Training in Belmopan. Our bungalow and the view at Popeye's.